Organizational restructuring within the Ministry resulted in fundamental changes to the service delivery model of the Traffic Data program. To improve the delivery mechanisms for the compilation and development of traffic data the following changes were implemented, methodology to calculate annual statistics, creating a homogenous segmented traffic network, and identifying the minimum level of traffic data required to sufficiently support ministry analysis needs. The Ministry changed their process for estimating traffic volumes on the provincial highway network from linear regression to the factoring method. The factoring approach is widely used in North America primarily because it is recommended in the Federal Highway Administration (FHWA) Traffic Monitoring Guide [1995, 2001], the AASHTO Guidelines for Traffic Data Programs , and the ASTM Standard Practice for Highway Monitoring (Designation E 1442-94). Prior to 2004, traffic data was collected based on summarizing and reporting statistics related to counter locations. This creates limits to the application of the data for broader transportation analyses that need to consider the traffic volumes between two locations such as highway corridor studies. To optimize the number of traffic counts required each year the Provincial Highway Network is divided into Uniform Traffic Volume segments (UTVS) within which the traffic volume is deemed to be consistent. Each UTVS is represented by a Traffic Measurement Site (TM Site), a cross section of the roadway at which traffic measurements are aggregates. 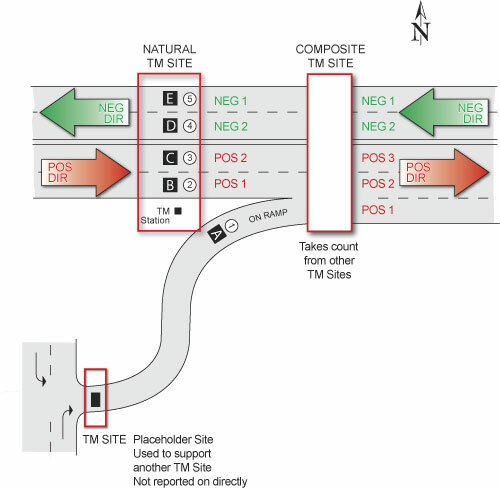 Pos 1, Pos 2, etc: Traffic Measurements for a single Northbound or Eastbound (Positive Direction) lane of the Highway. Pos 1 is the rightmost (and slowest) lane, Pos 2 is the lane to its left, Pos 3 further left, and so on. Neg 1, Neg 2, etc: Traffic Measurements for a single Southbound or Westbound (Negative Direction) lane of the Highway. Neg 1 is the rightmost (and slowest) lane, Neg 2 is the lane to its left, Neg 3 further left, and so on. Pos DIR: Traffic Measurements for all Northbound or Eastbound (Positive Direction) lanes of the Highway, as illustrated by Pos DIR above. Neg DIR: Traffic Measurements for all Southbound or Westbound (Negative Direction) lanes of the Highway, as illustrated by Neg DIR above. The Ministry will continue to monitor these UTVS segments to ensure they represent uniform traffic volumes sufficiently. It is expected that these segments will change over time as traffic patterns change and land use and land development create changes in traffic demand. TRADAS (TRAffic DAta System) has been used since 2004 to monitor, store and generate reports on traffic volume data. Listed below are reports published in this website from data collected at Permanent and Short Count Sites (2004 +). MADW - Monthly Average Day of Week, based on the number of days of valid data. Traffic Information Management System (TIMS) was designed and built in the early 1990’s. It was the corporate repository for permanent and short count traffic volume data. Traffic data collected between 1994 and 2003 was collected in 15 minute intervals for the entire year at permanent count sites and for a period typically 8 days long from short count sites. TIMS used the data from permanent counters to expand the data from short count sites by least squares linear regression to estimate an AADT, MADT, and SADT. The data from permanent count sites formed the statistical basis upon which the AADTs, MADTs, and SADTs were derived. The summary measures such as SADT were estimated from the short count sites created by comparing the pattern of data for each short count site to the most similar permanent count site. The result is an estimated average daily traffic volume for the months of July and August, rounded to the nearest fifty or hundred vehicles. Over the years, business unit demands for better traffic information to support their activities and decision making increased. New and expanded needs for speed and length classification data emerged. TIMS was not designed to handle these increasingly complex data streams thus would be replaced by the Traffic Data System (TRADAS) in 2004. The Ministry collects and stores traffic data at Traffic Measurement Sites (TM Sites) as identified by the triangle icons on the application map. The Ministry changed its traffic data collection philosophy in 2003 and as a consequence data collected before and after this change are stored as separate TM Sites. Permanent Count Sites are identified by Red triangle icons. Permanent Count Sites are identified by Light Red triangle icons. Short Count Sites are identified by Blue triangle icons. The traffic data presented in this application shows summary 10-year volume data at approximately 2,500 locations around the province. This data is presented as Annual Average Daily Traffic (AADT) and Summer Average Daily Traffic (SADT). Not all TM Sites were sampled in each year so reports on a specific time frame may include data from past years. The Transportation Survey GIS (TSG) application allows the Ministry to publish traffic intersection counts and other traffic measurement surveys from various locations around the province. Many of the TSG surveys in this application are intersection counts that identify turning and through traffic volumes during peak hours of the day at different intersections across the province. TSG users can view surveys associated with an intersection at locations indicated by a yellow diamond on the application map. The Ministry will continue to load new survey data into this application as it becomes available. Instructions for viewing and downloading surveys are available in the “Getting Started” section of the viewer. Intersection information is presented in the format received by the ministry. These surveys are contained in various document formats such as MS Excel, MS Word and Adobe Acrobat. The TSG application is available for use with two different viewers; the Public viewer interface is designed for simplicity while the Technical viewer interface has a greater variety of tools to manage information. Please note that both viewers present the same number of traffic surveys. You are welcome to use either viewer.